Although Venus is shown with a 4 part torso, mine has a 3 part torso. I was prepared for this possibility because a friend of mine showed pictures of the "Venus" body she ordered and it was also only 3 parts. Mirodoll should really change the pictures they have to reflect the product. Venus' head had a little damage inside near the magnet that looks like it was repaired with epoxy before shipping. Venus did not have an S hook in her head, but a handmade O-ring that was a real pain to get out and exchange for an s-hook. The resin quality is okay, but the surface finish is inconsistent. There are little shiny streaks and speckles that were not removed by washing. Lastly the jointed feet have no practical movement as the doll is currently assembled. Even considering all these points I am very happy with my purchase and feel that this doll is a very good value for the price. There are some quality problems but the actual engineering is very good, and the body is beautiful. Yes, I would buy from Mirodoll again. I believe so. This was my first big BJD so I don't have anything to compare it with. Very satisfied! With the product photo I thought it looked like a nice body but in person it turned out to be better than I had in mind. Muscles are nicely defined and all proportionate. Tell us some of the positives and negatives about this product. Pro: Beautifully made, no kinks or damages. Great body for a beginner to work with and get used to. Con: Doesn't stand upright well on it's own. Needed to hot glue the joints and wire him. Being muscular it's a challenge to find trousers that suit him properly. Just the bodies, not a fan of their heads. And a Yaya head (it came with a free 1/4 girl body). May 17, 2017; it arrived 2 weeks later. As far as I can tell it was really good quality for the price. The boy bodies were great for the most part. I was more surprised to see the some random sanding marks on the normal skin. However, It wasn't to bad. The free 1/4 girl body wasn't treated with too much care. The toes was a little weird, they are lumpy and need to sanded down. Also the hip joint doesn't allow the legs to stay shut... hopefully it's not a sign of the dolls personality LOL! The Yaya head also had a chunk of resin in her tear duct I had to cut out. The main positive is the price, the boy bodies aren't bad at all. They stand with no problem, and hold poses fairly well right out of the box, and I got a free body out of it. I already did. This is technically my second order from them. My first sill has yet to arrive, but that's a whole other issue. If I get a chance I'll upload photos later. Two bodies, a doll head (Apollo), a pair of shoes, a pair of pants. Yes it was. Everything was affordable. The bodies I ordered were on sale. Mostly. Unfortunately the head I purchased didn't match the body. But they said that the next time I order something, they will ship me the correct head colour for free. They were very nice about my problem and offered to rectify it with just my mentioning it, and without me actively asking for it to be fixed. The pants I got don't fit one of my bodies all too well, but it is no big deal to me. I definitely will! I plan on collecting a few of their dolls over time. My husband was also so impressed with the products and their service that he plans on making some of his own purchases too! I think Vivi actually looked cuter than her sales pictures. I really liked that the MSD dolls had joints on their feet (at the toe line) so that they could wear heeled shoes. Note 20170825: I found out that the XM dolls are actually from a from a sister company called Xingmeng. The hinged feet are apparently not standard on the 1/4 Mirodolls. 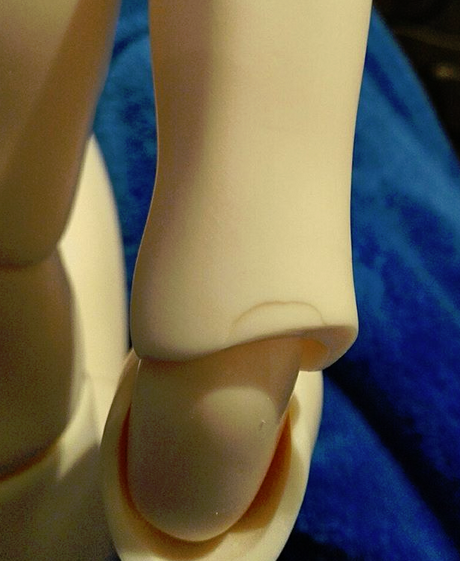 The SD doll has locks on her knee joints which I had never seen before and kind of like for that size doll. This was my first time buying new dolls (always got second hand on eBay before) and I was really pleased with the experience. The company ran out of stock for the shoes I originally bought and didn't notice until they went to ship my order. I picked out a different pair of shoes, but they also included the shoes I originally ordered in the smaller size as a gift. 1/4 Lili w/ face up in Burnt Sugar skin, 1/4 Lili w/ face up in Tan skin, 1/4 Yaya head w/ face up in normal pink skin, and 1/4 sized boots. Yup. I got them on sale with an additional promotion based on how much was spent. Yesss... though they were cheaper quality than I had been expecting after my first order with the company. The Lili's came with Miro Doll's v1 1/4 girl body and I received a free v2 1/4 girl body (that I put the Yaya head on). The v2 body is definitely superior to the v1 bodies. Both are very small, which is kind of nice since I've found I can fit them into the Tonner fashion doll outfits (if stretchy). I had to do hot glue sued on most of the joints of the v1 body in order to get any useful posing. And for some reason the eyes the dolls came with were too big for the eye holes? They didn't fit well and were all coming loose and wouldn't stay in when I tried to poke them back. I already did before I received this order. I'll probably order more sometime, but probably just to use for face up commission experiments and not for my collection. It's taken me a while to put myself together to write this post because of my disappointment and shock, but it needs to be made so Miro Doll can know there was a significant issue with my order. As far as the doll's engineering goes, yes. As far as the quality of her resin, it should not have been sold. Nothing like it. I don't mean the faceup, I mean the resin. The resin colour was smooth and even, with no unexpected lighter patches or inexplicable shiny patches or white lines. I do not count her the seam line areas in my assessment of the colour of her resin as they are understandable and were expected. She is a beautiful doll who has given me delight in making her wigs and giving her a faceup. However, I was highly dissatisfied by the quality of her resin and I will provide pictures in my review to illustrate my point. Pros: Body itself has no damage, poses well and the body and face sculpt are beautiful. Negatives: All the resin problems I have mentioned, as well as zero neck mobility (but she is single jointed). She cannot sit solidly unless she is slouching. Again, I have no issues with a single jointed doll in her price range having a lack of mobility. Maybe the double jointed bodies, there aren't too many head sculpts I like there. Definitely nothing darker than NS though. Pictures. There has been MSC layered on her body but ALL of these issues were there the moment I opened her. Some have gotten worse with time (like the scuffing on her nose, not pictures), others I have tried to disguise. These are the worst issues and again, have had nothing but 3 layers of MSC added, which did nothing to lighten or make her resin patchy. The tattoo on her left upper chest/shoulder is only watercolour pencil sealed by MSC. I have not used any abrasive cleaner, just a cotton washcloth to was her down and a damp, gently-applied magic eraser to try and buff out some white scratches from the resin. I circled the inexplicably shiny parts, the white lines and the parts that are patchy. Photo 1 is so bad it doesn't need me to highlight the issues. None of this is from sanding the seams. Those areas are done beautifully. I hate giving a negative review so I've tried to put some positives in because I have really bonded with the doll and her massive issues are giving me the courage to cover her in tattoos, but the problem is I bought this skin colour because it's so beautiful and I don't want to hide half her body behind tattoos because I need to disguise the damage that way or put her in neck to toe clothing all the time. YES! And then some, honestly. Very satisfied. Especially for my first BJD. -body needs work for a good posability range. Probably not, but only because I have all the dolls from them I want. For the price and speed, it was good enough for me. The match for my hybrid (Switch Doha head) is nice enough! I am satisfied! Seems to be an ok body in general, with some love n care. Positives: I like the color though it has to be blushed a little for my hybrid. I like the general sculpting, especially the torso. Negatives: There's some resin debris in the joints. Some joints has dirt and scratches (can surely be cleaned+sanded). One hand had slight marbling but I intend to change hands anyway. The biggest issue is one elbow having a chip/dent of some sort. Yes, both are on sale. Minor things like sanding marks are visible on mine. I personally don't mind because clothes are going to hide it anyway. Some parts aren't sanded well but then, I can do it myself so it's fine. The 66cm body is a gorgeous sculpt as it is and the peanuts add more articulation in the joints, which I love the most about this body. I used this body to hybrid with my floating April Story head. The resin match is quite far but this I don't mind as lighting plays the trick. I enjoyed it more than the default body Rain came with (single jointed knees). There were some posability problems though I could not guarantee this a hundred percent because I haven't restrung it yet. But for me, it isn't a problem at all, for now. I ordered at an event price, so the quality is really okay. Cons: From what I gather, newbies to the hobby often consider this company for their first doll. Now I know the bodies have some issues which might frustrate somebody who is new to the hobby. 1) There is no notch in which the S-hook can sit in safely. What was not a big problem to me, because I simply dremeled in this notch, could be a rather unpleasant surprise to a newbie: the moment when the doll's head is turned, and the S-hook flops through the neckhole. 2) The headcap did not sit perfectly flush. This is not such a biggie to me, as I simply made the notch for the headcap hook a tad deeper. Normally, this is mostly covered by a wig anyway. But as my Hector will portray Captain Rex from Star Wars, he will have his signature haircut, so the headcap groove is important to me. But the headcap held on fine from the getgo. 3) The eyewells were not quite deep enough to accomodate the eyeballs properly. I used a balltool for my Dremel and changed that. Again, that can be something which frustrates a newbie. Without that little mod, all the eyes I put in looked a bit funny. 4) His nose has a little ding, which again does not bother me, as it is appropriate for his character. Maybe a head, but most likely not a body. They are okay, but not of the greatest quality. The interior of the head was also a bit unfinished, but it does not bother me. Overall, Mirodoll is not a bad company. You get workable items, if you are prepared to do a little work. Like I said, I would not recommend them for unexperienced beginners who want dolls to function right out of the box. Sorry for the extended length, there are 3 dolls, 2 wigs and one pair of heeled feet I'll be discussing in the next 3 posts I make here (too long for all three in one post). The packaging was good, I did notice a bad chemical smell from the dolls that I hope dissipates soon, and the pillows are my favorite green color! It was pretty much 'You get what you pay for.' If I want a doll that works for me that I don't mind possibly destroying to gain experience then YES, the quality is appropriate for the price. If I was aiming for a pretty doll I could show off in professional photos for something like tattoos or skimpy clothing I have to say NO. I found the Head and Body separately in different sections later, which really doesn't work great when looking for a specific doll and wanting to see both head and body attached, without clothing or face-up. From what I can tell, yes the head looks pretty close. The same with the body, the new 62cm girl body. She's jointed twice in the body, something I've never had before and her posing options are opened thanks to that. Her hands and feet looks nice, not too masculine, though I'll be re-doing how they are posing (the fingers are really stiff looking, not very natural posed). Her head is pretty symmetrical, which is something I love to see in a doll. She's double jointed in the knees and the little notches (forget what those are called) that let her keep a pose are nicely placed. Her arms are nicely proportioned, she doesn't look emaciated, and her knee sculpt is great. You can tell where she was sanded on most of her body, there are shiny patches and thin scratch-marks. The joint on her body nearest her breasts is actually sanded pretty badly - it looks chipped - and I think there's a stress mark in it that I'm going to have to be very careful working with. Her eye sockets aren't sanded well at all. The resin they used had some sort of dots in it, it doesn't show up well in my phone camera (all I have this moment), but she has some dots near her eyes, one on her left leg, and a tiny thread embedded in her right shoulder. There is a bubble mark just under her left breast. I can work with that (a beauty mark for example). This is most likely not a defect, but the wrist joints are thick and difficult to move the hands more than a few degrees in any direction. There's a small black speck of something embedded in the resin near one of her eyes, it's sort of weirdly stuck to her. Looks like shallow gashes in the side of her face?! I'll include pictures. As much as I love their customer service & how fast they respond, I have to say no. I love the customer service, but there are too many big negatives compared to big positives to these dolls for me to want more from their collection any time soon. The original sculpts from Mirodoll could use some fine detail adjustments to make me really want to buy from them again.The details are pretty good overall for proportion, and the hands and feet are pretty decent as well. I suggest that this company is a good STARTER area for bjd mod enthusiasts....not so much for a beginner in the hobby. These are my initial thoughts on the dolls I JUST received, so I'm running high on adrenaline from excitement and disappointment both. I will update this once I've spoken with Mirodoll about the questions/issues that have occurred on Monday. Ya get what ya pay for. I'm more satisfied with this head than the other heads. Her ears are in the right place, her eye wells ARE rough but not so badly I can't work with them....it's her body that is making me groan in frustration. Her sculpt is almost perfectly proportioned in body and face. Her hands aren't the same sculpt? Not sure if that was planned but one has a middle finger more curved than the other hand. Her arms are somehow....bulky? Much more masculine looking than the original single joint body has. There's more detail to them, though they are somehow bigger than seems appropriate for her torso. Her overall sanding is needing more work, there's scratches on her chest that I'll be buffing out, and her joint sections need sanding as well to smooth out rough edges. Most importantly NO, the head is warped, unless the right ear is supposed to be on the cheek. The body looks alright but there's something somewhat disturbing on the body and elastic that I'm worried might be blood. Pics included in the spoiler. No. This doll head was not supposed to be distorted. The body is a single jointed torso, so I know how to pose her properly for best results. The hands are uniform for design, I love how the knees are sculpted. She sits like a DREAM! Her shoulder balls have the stopping nubs for posing. Her elbow 'joints' are literally balls. Her eye wells need to be sanded, not a lot, to smooth them. Half her face is somewhat droopy, I'm guessing she was pulled from the mold too soon? Her head cap doesn't sit flush with her head. There's RED stuff on her NECK. And brownish stuff on the elastic. PLEASE tell me someone wasn't sanding her and bled on her and didn't clean her up properly. I hope it's rust. Or demolding agent. Or something besides what my gory mind took me to. 1/3 Heeled Feet, and Two wigs: 1/3 Wig 05 and 1/4 Wig 02. The heeled feet are perfect, no problems with them at all. The wigs......could use some work. 1/3 Wig 05: it's the long blond wig, and yes it's fairly long. 1/4 Wig 02: is the short, colorful bob. No. The hair came neatly packaged in mesh baggies, which was nice. Everything was packaged securely. The heeled feet didn't come with S hooks, so I'll need to find some specifically for the heeled feet. The Wig 05 (blond) and Wig 02 (colorful) are both thinner than I expected. I can see the wig cap when I put the wig on the heads. They honestly look only vaguely similar to their website photos. I was most disappointed in the colorful wig, it has a LOT more blond hairs in it than white, the white is more of a dull grey color, and somehow the blond is much longer than the rest of the colors? We'll see once I trim and style the hair a bit, maybe it's just the way the hairs settled on completion of the wig. I did a group order with a friend: 1/4 doll Yaya in normal skin, 1/4 girl body in normal skin, free event head Polly in normal pink. I just needed the body for a hybrid, for a gift. I ordered normal skin because my friend has a Mirodoll BJD already and my head matched her doll pretty well (she's from late 2017, if she has yellowed it's really light). August 2018, because I needed the body for October 2018. The dolls are good. It's a bit weird that the Polly head (1/4 size) is way too small for any of the 1/4 bodies. The bodies pose fairly well. However, the resin colors are completely wrong. Only the Polly head was ordered in normal pink, the other 2 are normal skin, and everything arrived in the same color, all pink. In shape, yes. In color, no: the normal skin resin is the same as the normal pink resin. Yaya full doll & 1/4 body, in "normal skin"
On the left, our order (only the floating head should be normal pink). On the right, my friend's Mirodoll 60cm body in normal skin (late 2017). No. I needed the body for a hybrid, so there goes that. And my friend wanted her doll in normal skin, not normal pink. We are both pretty disappointed. We have both contacted Mirodoll about this issue, she has been ignored and they have answered me, but they pretty much told me that's how it is. They said that batch of resin had more red in it, whoopsie. I understand that resin can vary from batch to batch, but normal pink and normal skin are supposed to be two different resin colors, and they most definitely are not in this case. They want us to ship the body to another buyer (they will sell it online, I guess? ), which seems pretty unprofessional to ask a client to do after you messed up, but whatever. After that, they will make a replacement, supposedly. But I highly doubt it will arrive in time for when I need it, or arrive at all, with all the stories I've heard about Mirodoll never sending or making replacements. Probably not. Depends on how they handle this issue, but so far it's been a disappointment. When we first said that my friend would like to keep the body (for the Polly head), they read our messages but ignored us for several days. They didn't answer until I sent another message saying she didn't want to keep it in the end (when she realized how weird the head looked on the body, the proportions are off). 1/4 Lili, 1/4 boy body, couple of years old 60cm female body from storage and pair of black boots. Yes. The bodies are well made and pose really well. I didn't get high heel feet for females as some have, the site doesn't say exactly what all comes in package. Lili head had uneven eyes that I had to sand to be more even but otherwise it's good quality. The old 60cm body isn't balanced, I think the big chest makes it so front heavy. It was really badly yellowed and uneven coloured but it was told and seen in price. It needed lots of modification with strings to get it pose well and for beginner this caused trouble. The boots were really well made and sit the doll perfectly. Head very much. Bodies yes. Considering the ban maybe not. I would buy bodies for hybrid but would need proof the body is their own design.